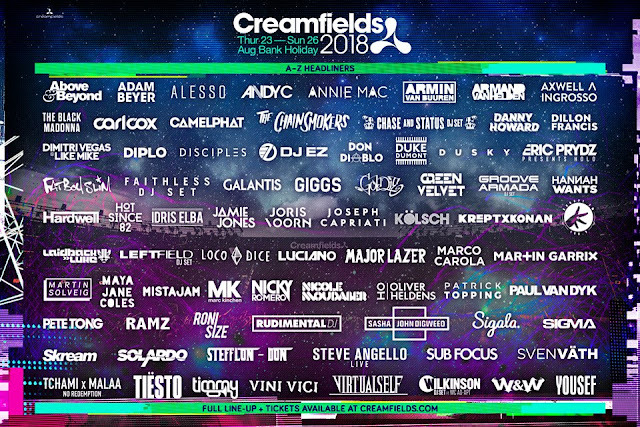 With 21 years at the forefront of electronic music festivals, there are very few that quite compare to the behemoth that is Creamfields. 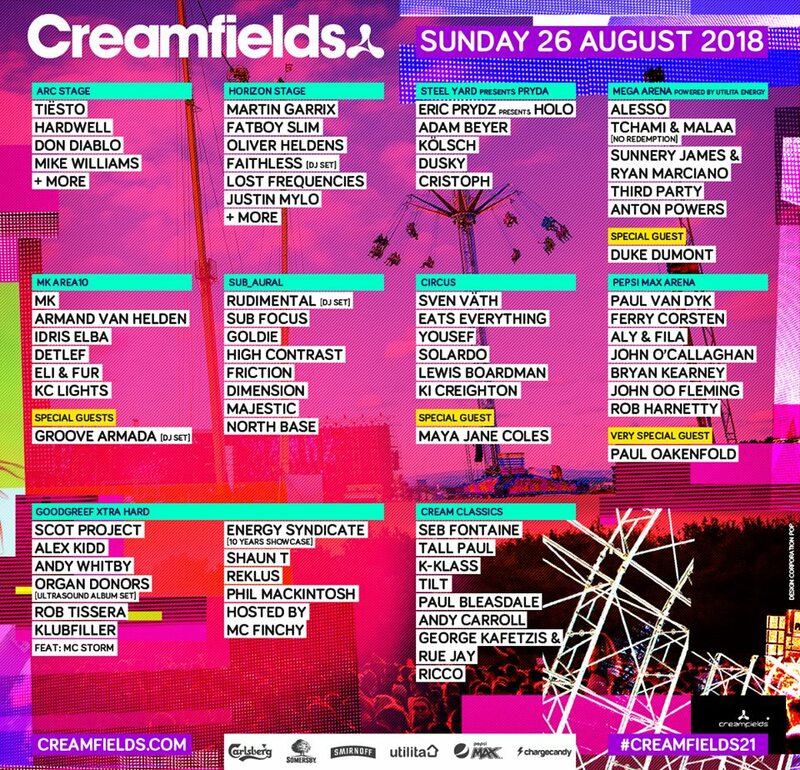 For the 2018 edition, the festival once again unleashes a stellar line-up that is mind-blowing in depth and breadth, with artists from across the full-spectrum of dance music set to make the trip to the fields of Cheshire for another 4-day extravaganza that looks set to be bigger than ever. 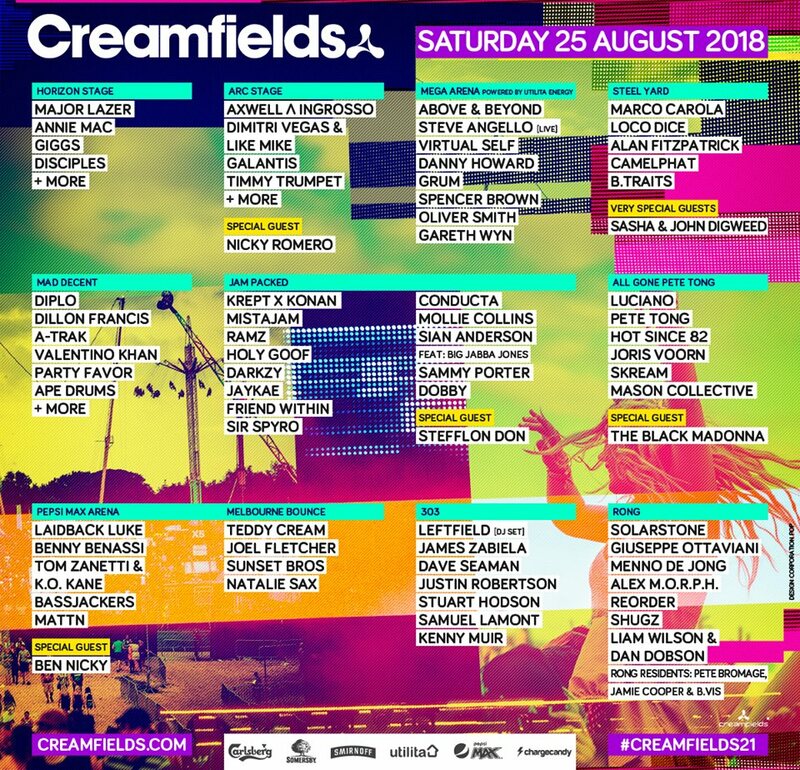 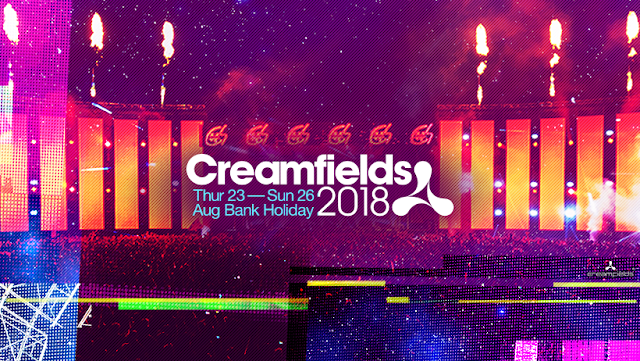 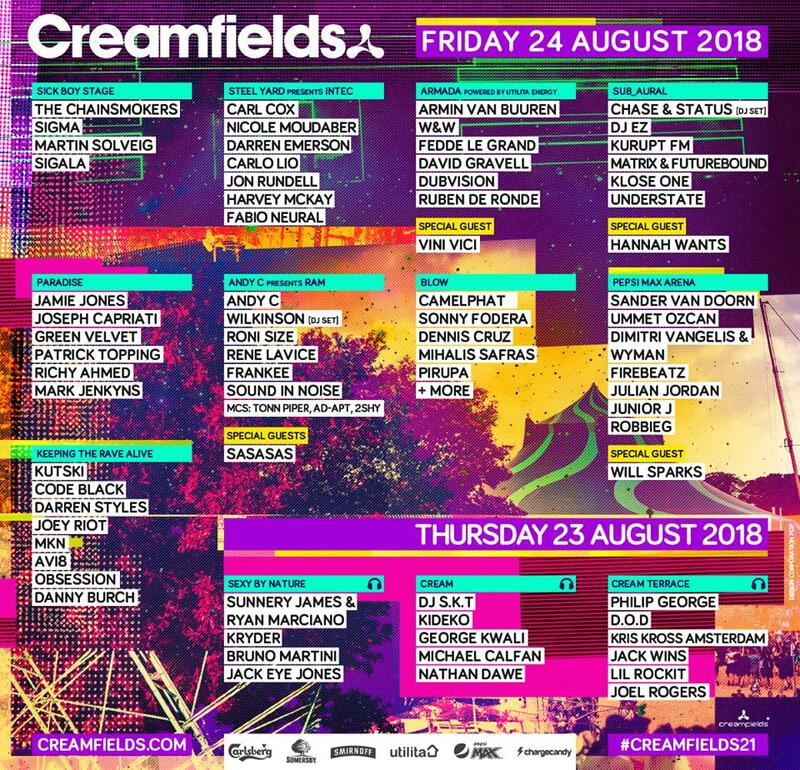 Taking place on August Bank Holiday weekend, Creamfields 2018 will see over 300 artists perform across 30 stages, for a 4-day spectacular that will see 70,000 people come together for what has now taken pride of place as the premier event for dance music fans across the globe. 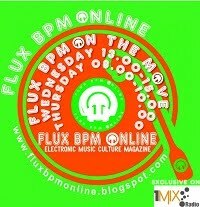 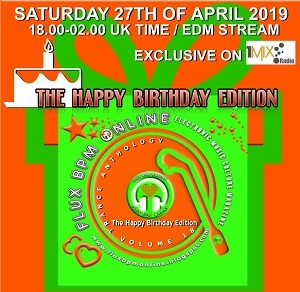 From house to techno, trance to drum & bass, this year’s edition has it all, featuring performances from the likes of Above & Beyond, Adam Beyer, Alesso, Andy C, Annie Mac, Armin van Buuren, Armand van Helen, Axwell & Ingrosso, The Black Madonna, Carl Cox, Camelphat, The Chainsmokers, Chase & Status (DJ set), Danny Howard, Dillon Francis, Dimitri Vegas & Like Mike, Diplo, Disciples, DJ EZ, Don Diablo, Duke Dumont, Dusky, Eric Prydz presents HOLO, Fatboy Slim, Faithless (DJ Set), Galantis, Giggs, Goldie, Green Velvet, Groove Armada (DJ Set), Hannah Wants, Hardwell, Hot Since 82, Idris Elba, Jamie Jones, Joris Voorn, Joseph Capriati, Kölsch, Krept X Konan, Laidback Luke, Leftfield (DJ Set), Loco Dice, Luciano, Major Lazer (Live), Marco Carola, Martin Garrix, Martin Solveig, Maya Jane Coles, Mistajam, MK, Nicole Moudaber, Oliver Heldens, Patrick Topping, Paul van Dyk, Pete Tong, Ramz, Roni Size, Rudimental (DJ Set), Sasha & John Digweed, Sigala, Sigma, Skream, Solardo, Stefflon Don, Steve Angello (Live), Sub Focus, Sven Väth, Tchami & Malaa (No Redemption), Tiësto, Timmy Trumpet, Vini Vici, Virtual Self, Wilkinson (DJ Set) feat. MC AD-APT, W&W and Yousef to name a few. With ground-breaking stage production, a wide-range of camping options – including the luxury Dreamfields packages – and a range of music that is sure to get the pulse racing, it’s a sure bet that Creamfields 21 is going to be one to remember.